Program #CULT023. Recorded in New Delhi, India on May 8, 1978. Debu Chaudhuri Sitar Maestro plays Raga Marwa with Gopal Anand on Tabla and David Barsamian on Tanpura. A brilliant seventy minute performance of the haunting twilight raga Marwa. 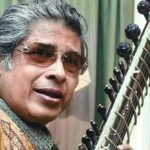 Maestro Chaudhuri. begins with a traditional alap, introduction to the raga. That is followed by tabla accompaniment in Masit Khani (slow) and Reza Khani (fast) compositions in teental, 16 beat time cycle. Recorded live in Kamani Auditorium.